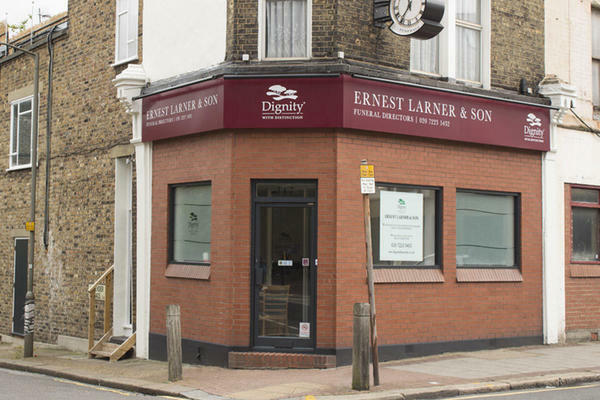 Ernest Larner & Son Funeral Directors in Clapham Junction are here for you in your time of need. Our kind and caring team will offer comfort and consolation during this difficult time. From a traditional, religious ceremony to a colourful, elaborate celebration, whatever type of service you choose, we will make sure it is a personal and heartfelt tribute to your loved one. You can rest assured every detail will be taken care of with integrity and kindness, just as they would have wanted. We love our London community and everyone that is a part of it. Our Clapham funeral directors has been helping families of Clapham, Battersea, Putney, Fulham, Balham Wandsworth, Southfields and beyond since the nineteenth century. Our funeral home also has two chapels of rest where you can find peace and solitude if you wish. This choice is completely yours. We are here to help 24 hours a day, so call us whenever you need someone to talk to. Call us today on 020 7223 5432 to talk through your personal requirements. At Ernest Larner & Son Funeral Directors, we understand how special life is with those that you love. For us, every funeral is unique and personal. We have a service to fulfil every wish, with every detail carried out with the same uncompromising quality of care. From a traditional service, to a colourful woodland burial, your options are limitless with our Full Service Funeral. If you have a little more flexibility when it comes to arrangements, then we can provide a Simple Funeral for a lower cost. There are two bays available for up to four hours. There is pay and display parking on surrounding roads for £3.00 per hour. We are across from Grant Road, opposite Providence House and Youth Centre. Our staff are available 24 hours a day on 020 7223 5432 if you require our services outside of these hours. I am very appreciative of the way Ernest and Larner Battersea treated me. They were kind understanding and accommodating of my needs during a very difficult time. On the day of my mother's funeral I was very well looked after and respected with a lot of compassion by Jackie. Denise at the office listened to me was very helpful and understanding and responded to changes in my requests smoothly.